Since I was young I always loved the thought of a dedicated hobby room filled with my lovely craft supplies, a room where I can sit and create and be inspired. When I bought my first house a few years ago I was finally able to get that room, and it has given me lots of joy so far. Even though I finally had a room for my crafts there was one thing the room lacked, furniture that worked well. Except for one drawer section I bought years ago on a garage sale there are no furniture in the room that I like. Right now my craft supplies are organised in shoe boxes or jars I've gathered over the years, it's not ideal but it works. The biggest problem is that even though I've got places to put most things it looks messy. I had accepted that the perfect hobby room would be a dream I would have to hold onto a few more years, but then a month ago my wonderful husband told me that we could spend a portion of our saved money for new furniture. Instantly I tried to find cheap but good options for my room. IKEA was of course the best option, not only because they have cheaper furniture but because they have a larger selection. I also knew I wanted something with doors and drawers. In the beginning I was looking at office furniture and found that GALANT was a nice series that could work for me, as well as an ALEX drawer section. 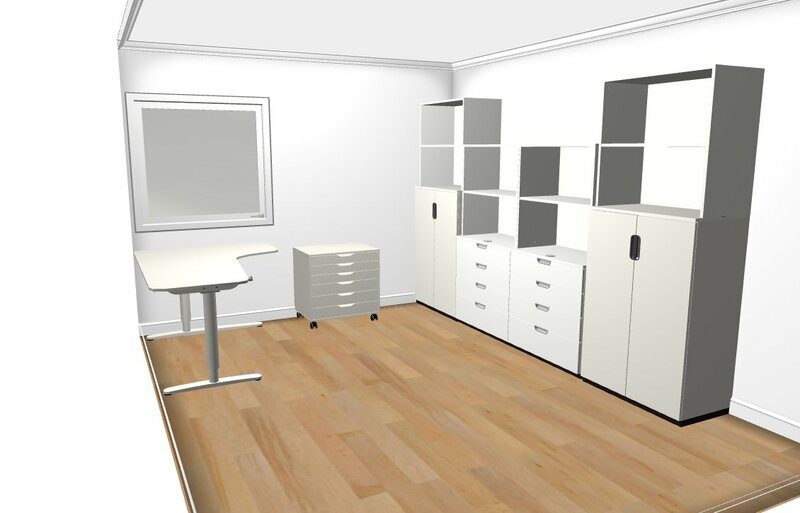 I played around with the planner IKEA offered and managed to get a nice combination of furniture that could work. I also looked at bookcases, but none of them would work in the way I wanted it to. I was content with my decision and was ready for the day we would head to IKEA to pick up the chosen furniture. I'm glad we hadn't had the opportunity yet as while I was watching a Home Improvement show I realised there was one option I hadn't looked into, kitchen furniture! 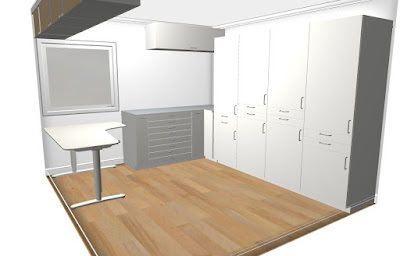 Finding furniture similar to the original plan wasn't too hard, in fact, the kitchen section offered far more options than the ordinary shelves did. After some more planning I was able to find a great solution for my room, it cost a little more than the first plan, but I get twice as much in return. We ordered the furniture yesterday and they will deliver them on the 25th, meaning I have a little more than two weeks to prepare my current room for the new furniture. There is of course far more on my order list than the images show, but you can see the largest items (except the drawer section that will be kept.